Over this article, we will guide you how to root your Motorola Atrix HD smartphone. One of the best part of rooting is; it will allow the third party tools to access the system files so that the required customizations can be done. Additionally, rooting allows you to install many custom ROM firmwares and apps which needs root access to enjoy its benefits. The tool which is used to root Motorola Atrix HD device is Motofail2Go. Make a note that upto now this tool only supports Windows based computers. As of now, there is no ETA on by when there will be an official update will be arrived for Motorola Atrix HD smartphone. But many custom ROM firmwares were available to this device thanks to the developers who works constantly to come up with the updates. It is vital to create backup of your datas before you start to root your device. But don’t make use of PC Suites to create backup because it does not detect your device. After that, enable the USB Debugging in your Motorola Atrix HD smartphone by following the path “Settings > Applications > Development > USB debugging” and ensure that the USB debugging option is ticked. Make sure that you have left the battery level of atleast 30% or else there is a risk of your device getting turned OFF in the middle of rooting process. Disable all the antivirus tools in your Motorola Xoom; because it may interrupt in the rooting process. Finally, make sure whether you have done all the above mentioned instructions properly, after that head over to the next step where we have summed up a detailed tutorial on how to root your Motorola Atrix HD smartphone. DISCLAIMER : Please proceed the below guide at your own risk. We and even the developer won’t be responsible for any damage that takes place to your device. First download the Rooting Exploit Tool for Motorola Atrix HD smartphone and then extract the same on your desktop preferably wherein you will a folder named as Motofail2go. So, once you have got the folder, connect your smartphone to the computer with the help of original USB cable and then also make sure that you have latest ADB drivers installed which you can get from android.com. After that double-click the option “run.bat” and follow the instructions. The exploit tool will ask you to press a button combination at one point. Congrats! 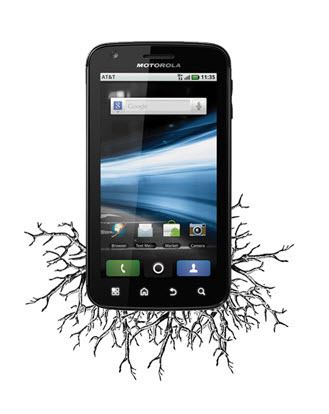 now you have successfully rooted your Motorola Atrix HD Smartphone with Just One Click. If you wish to check whether your device is rooted or not you may download the “Root Checker” app from the Google Play Store.